ABC has announced they are canceling two of their daytime soap operas "One Life to Live" and "All My Children." "'All My Children' and 'One Life to Live' are iconic pieces of television that have made an indelible mark on our culture's history," says Brian Frons, President, Daytime, Disney ABC/Television Group, in a statement. "Each of the shows has touched millions and millions of viewers and informed the social consciousness. It has been a privilege to work with the extraordinary teams who brought the residents of Pine Valley and Llanview to life each day, and we thank the cast, crew, producers and most especially the fans for their commitment to the shows through their history." Frons insists each show will end in a manner that will respect their legacies and honor their passionate audiences. 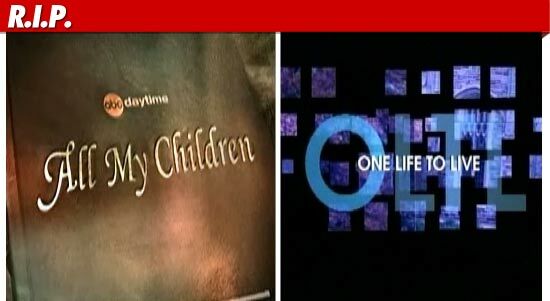 "All My Children" will end in September 2011 while "One Life to Live" will finish its run in January 2012. Soap opera fans can at least find a bit of solace in this news: "General Hospital" will remain on the air. "More than 40 years ago, Agnes Nixon created both the worlds of 'All My Children' and 'One Life to Live,' worlds that the rest of us have been privileged to live in," said Frons. "Her shows led the way forward, breaking a lot of rules along the way to defy expectations about what soaps can do and the issues they can cover. I am honored to have worked with her." "All My Children" premiered on January 5, 1970 and has received more than 30 Emmy Awards. "One Life to Live" debuted on July 15, 1968, and received its first Emmy Award for Outstanding Drama Series in 2002. Although I grew up on the CBS soaps, I have to say this is a very sad day in the world of soap operas. Erica Kane is a legendary figure that crossed over into the pop culture landscape and who can forget Angie and Jesse. Looks like Young and the Restless, Days of Our Lives, General Hospital, and The Bold and the Beautiful are the last dinosaurs standing. I can honestly say I don't really watch any soaps anymore except on occasion when I try to catch and episode of General Hospital ( I stopped watching Young and the Restless after Sharon and Adam got back together). I guess we can start the countdown for when the next soap will be canceled. That person has alot of nerve taking those amazing soaps from their fans!! I am a everyday OLTL watcher... There are plenty of damn talkshows & shows abt food & obesity, is there anything OLTL fans can do to save our show? This makes me sad. I never watched 'One Life to Live' and was never a die hard 'All My Children' fan. I still remember how for many summers every day she made us lunch just before the show and all of us kids would sit and watch it with her while eating. It was an event for us every day. And as kids it gave us a way to tell time during the day. I'm glad both shows had a good, long run.